The Bachelor's in Computer Information Systems (CIS) Degree at St. Scholastica is an innovative alternative to the computer science programs offered at many colleges and universities. Students in the program learn current and emerging computer technologies and the means to apply these system technologies in solving organizational problems. In addition to the core computer concepts, students select a specific application concentration in software development, business analysis, mathematics and health informatics. Students may also seek departmental approval for a custom designed concentration. Graduates find work in a variety of large and small organizations as Web developers, software engineers, application programmers, database specialists, and business/system analysts. Some graduates are working for computer consulting firms or working as entrepreneurs, while others are managing the information systems of large and small organizations. The CIS program is offered in a Traditional undergraduate education format. It is also offered as a 100% online degree program. Computer information systems students work on a variety of research projects and present their findings at conferences such as the Society for Advancements in Information Systems (SAIS) and the National Conference on Undergraduate Research (NCUR). Student, Zach Zimpfer, recently presented at SAIS and his paper was accepted for publication in the SIAS journal. His paper talked about the ethical dilemma regarding artificial intelligence. 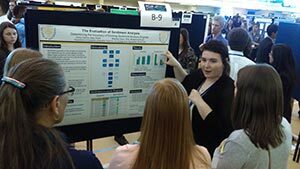 Students, Heather Carlson, Abby Panfil and Emily Ciernia presented their Research on sentiment analysis and robot navigation at NCUR. Thanks to a grant from the Clare Booth Luce Program, female students in science, technology, education, and math fields gain valuable hands-on research experience.